The third meeting of the Red Kite network will be held on Thursday 10th January, 2013 in the Main Lecture Theatre in the Physical and Theoretical Chemistry Laboratory, Oxford. Attendance will be courtesy of the John Fell Oxford University Research Fund. The meeting will consist of three sessions, each commencing with a half hour Plenary delivered by a leading academic, followed by three shorter talks by younger researchers. Please check out the program for more details and email Amber L. Thompson (amber.thompson @ chem.ox.ac.uk) BY MONDAY 10TH SEPTEMBER, if you would like to attend the lunch and the drinks reception after the meeting (these will only be available to registered attendees). Overlapping absorption edges will occur when an element is present in multiple oxidation states within a material. 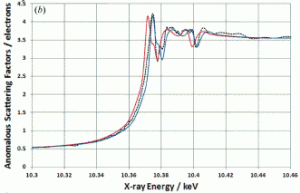 DetOx is a program for partitioning overlapping X-ray absorption spectra into contributions from individual atomic species and computing the dependence of the anomalous scattering factors on X-ray energy. It is demonstrated how these results can be used in combination with X-ray diffraction data to determine the oxidation state of ions at speciﬁc sites in a mixed-valance material, GaCl2 .